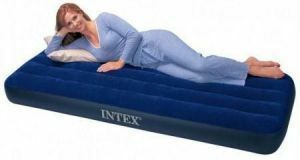 Intex Downy Airbed. With plush flocking on the top, this airbed gives a more luxurious sleeping surface and helps keep bedding from slipping. Flocking cleans easily and is waterproofed for camping use. The wave beam construction provides a uniform sleeping surface. Crafted with cozy flocked tops and heavy gauge vinyl that is durable and easy to maintain. Quality tested 20.8 gauge (0.53mm) waterproof flocked top with 14 gauge (0.3mm) vinyl beams and 15 gauge (0.38mm) bottom. openings for fast inflating and deflating. Conventional junior single mattress size for more sleeping area and a better fit for sheets. 8 (22cm) mattress thickness for extra soft comfort. In this bed use of solid carbon thermal polymerization into pvc system, the role of anti-wear, you can directly on the ground. guests for the family bed, a bed temporary use. Chongqichuang small size, light weight, and release them after the volume of gas with the average home sheets as large as the size and weight of light, folding up stuffed into backpacks to carry their own anti-humid with the function, when not a bed Chuangjia directly on the ground to sleep on. The detection of Quality Supervision, Inspection Station, confirmed that the product quality problems. Inflatable furniture: sofas, mattresses and lie, Any marked for weight, bearing not more than 100 kg.